Enter for a chance to win a gluten-free Happybelly Box! 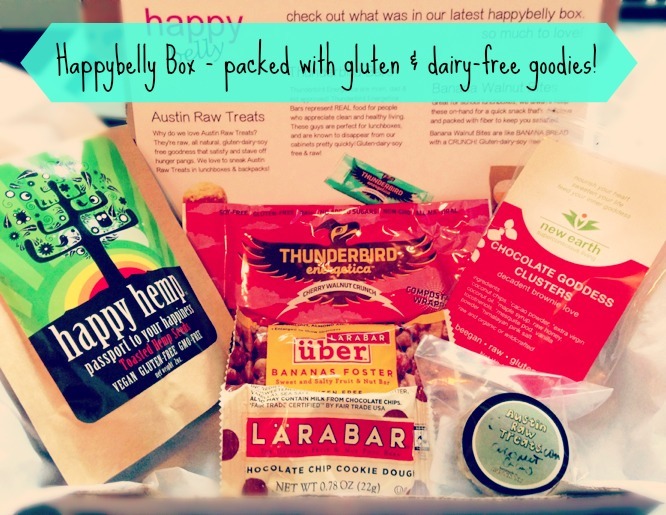 Comments Off on Enter for a chance to win a gluten-free Happybelly Box! For those of you who aren’t aware, we launched our gluten-free samples program, Happybelly Box last year, and we’re excited to offer you a chance to win a free sample box packed with our delicious, favorite gluten and dairy free snacks! These treats are perfect for your backpack or lunchbox and we keep them on hand at all times to make sure we have a safe and healthy treat option when hunger pangs hit! How do you enter for your chance to win a FREE Happybelly Box? Simply head on over to our site, Happybellybox and register for your chance to win. Whether you’re news to the gluten-free lifestyle or consider yourself a pro, our snacks are sure to please! They’re hand-picked to include our favorite snack foods and are often vegan, Paleo and are always packed with super-foods, nutrient-rich goodness. Our back to school, gluten-free snack pack giveaway is live! It’s that time of year again; the kiddos are back in school, the 20 MPH lights are flashing reminding us to take things slowly (which is always harder to remember when life gets back to a normal routine) and we’re all scrambling for ideas on what to pack in their lunchboxes. Since we have access to some amazingly yummy and healthy foods through our online shop, Happybelly Box, we thought it would be a good idea to package them up into a nice little giveaway for you. Then, when you try them and figure out which of our gluten-free, dairy-free goodies you can’t live without, you can head over to our online shop and grab some more to have on hand. Our giveaway box will include some of our favorite treats including Thunderbird’s Almond Cookie Pow Wow (think almond cookies), organic superfoods including Almond Courage, our favorite indulgence, Chocolate Goddess Clusters, and some Epic Protein Bars to help keep you going throughout the day. How do you enter for your chance to win FREE Happybelly samples? Simply follow the instructions on the widget below to be entered for your chance to win free samples. Feel free to sign up for your loved ones who are on the hunt for safe gluten and dairy free food options as well. Be sure to comment below and tell us which products you love, and what new ones you’d like to see us include for next time!